서천리당산은 당산나무, 돌장승(벅수), 솟대로 구성되어 있으며 마을의 수호신으로 모셔지고 있다. 남녀 한 쌍인 돌장승은 운봉초등학교 서쪽 500여m 지점에 마주보고 서 있고, 주변에 당산나무가 있다. 장승과 솟대를 함께 세워 제사를 지내는 것은 전라도 지방에 남아 있는 당산신앙의 한 형태로 원래는 이곳에도 솟대를 함께 세웠던 것으로 보여지지만 마을 중앙에 있었던 솟대의 모습은 사라지고 흔적만 남아 있다. 마을의 허한 곳을 방어하고 서쪽을 진압하기 위해 세워졌다고 하는 석장승의 몸체에는 각각 ‘방어대장군’·‘진서대장군’이라는 명문이 새겨져 있다. 남자 벅수인 방어대장군은 머리에 모자를 쓰고 튀어나온 둥근 눈에 주먹코와 아래로 쭉 뻗은 송곳니가 있다. 가슴에 수염이 있으며, 귀가 없는 것이 특이하다. 여자 벅수인 진서대장군은 머리에는 벙거지모양의 돌모자를 쓰고 둥근 눈에 주먹코와 귀가 있다. 다른 여자 벅수에서는 찾아보기 드물게 속눈썹이 깊이 새겨져 있는 것이 특징이다. 이 석장승들은 만든 이가 다른 듯 벙거지의 제작형식이나 표현기법이 서로 다르다. 구전에 따르면 장승이 부부싸움을 하다 진서대장군의 목이 부러져 마을 사람들이 붙였다고 한다. 마을의 안녕과 복을 빌기 위해 매년 음력 정월 초하룻날 당산나무에 제사를 지낸 다음, 석장승에게도 간단한 제를 지냈다. 석장승은 마을 수호의 부수적인 신이지 주신(主神)은 아니다. 서천리 당산이 언제 만들어졌는지 정확히 알 수는 없지만 옛 모습이 잘 간직되어 있고 민간신앙을 보여주는 한 형태로서 가치가 있다. 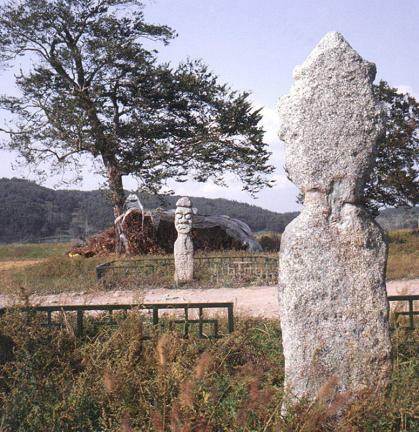 The village guardians in Seocheon-ri consist of a tree, stone posts and a pole, which have long been worshipped by the local people. About 500 meters west of Unbong Elementary School, a pair of man and woman posts are standing facing each other, not far from a guardian tree. 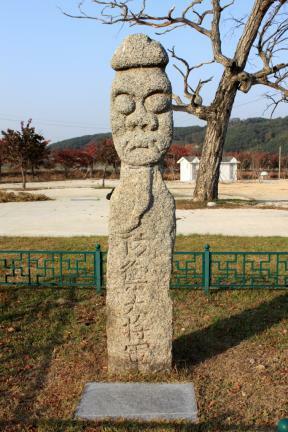 A pole must have been erected according to the old custom of Jeolla-do in which stone posts and a pole were worshipped together, but only a trace of the pole remains in the center of the village. 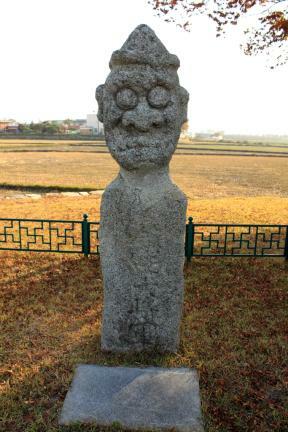 The paired stone guardian posts were said to have been erected to defend the village’s vulnerable area and to subdue the west side, so they were named Bangeo Daejanggun (Great General of Protection) and Jinseo Daejanggun (Great General Conquering the West) respectively. Bangeo Daejanggun is the male post with round bulging eyes, a stubby nose and long canine teeth protruding downward, and wearing a hat. Very unusually, it has hair on its chest, but no ears. Jinseo Daejanggun is the female post, with a stubby nose and ears and round eyes. 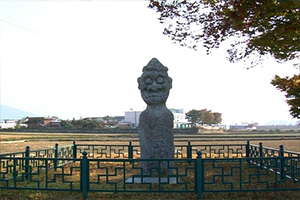 It also features a stone hat resembling a beonggeoji (military official’s hat). Unlike other female guardian posts, this particular one has deeply carved eyelashes, which is a very unique feature. Each guardian post is differently styled, and the different depictions of the hat clearly show that they were made by two different artists. A legend tells that the neck of the female pole was broken after the totem pole couple had a furious fight, and that the villagers attached it back later. For the well-being and prosperity of the village, villagers dedicated a ritual to the guardian tree and then to the stone guardian posts every year on Lunar New Year's Day. The posts served not as the main deity, but as secondary deities. They have been well-preserved, and though their exact production date is not known, they offer valuable information about folk beliefs.